Enter the word or string you wish to find in the current conversation. 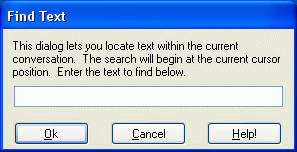 Press Enter or click on OK to search, or press Esc or click on Cancel to skip searching. You can get to this dialog fastest by using the shortcut key (Ctrl-F). Find the word or string that was last searched for again. This can be used to find a word if it exists several times throughout a conversation.